These photos from cotton farmers Kelly & John Whatley in South Texas will show at least part of it. Take a look at Kelly’s Instagram account and you’ll see more recent photos — they are harvesting some fields now! Well first, farmers pay close attention to the plants. They know what plants look like when they have a lot of growing left to do by looking at how close to the top the white flowers are. As the flowers turn to bolls, there are other things to look for with cotton fields. With a good load of hard bolls, the changes in coloring on the plant is a sign that the plants are beginning to dry down. Farmers will pull hard bolls and cut them open to get a good feel for how close the plant is getting to maturity. 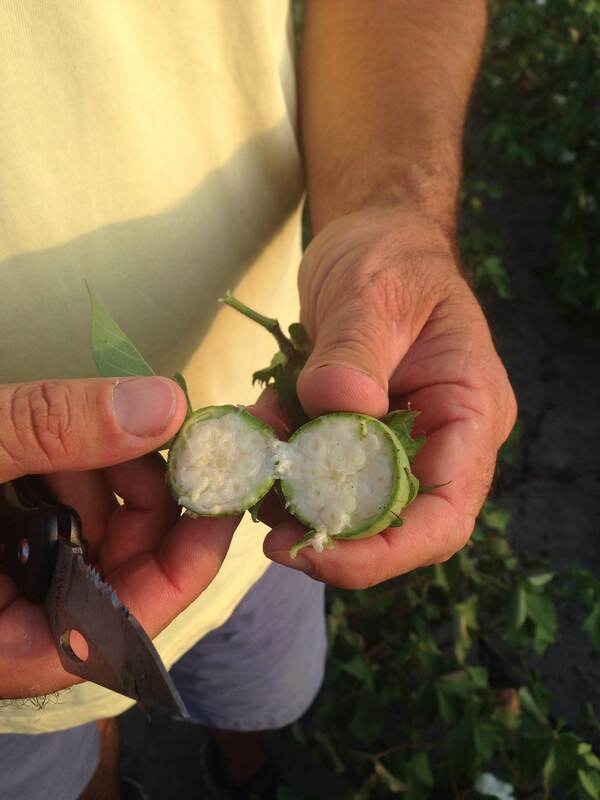 When a farmer looks at the cut open boll, there are a few things they are looking for…. one is how wet the lint inside the boll is but it is also important to look at the seed that is developing inside the boll. In fact, the seed is the most important factor in determining maturity! Without the seed maturing to for the embryo to firm up (otherwise it is a bit like jelly) and developing a good seed coat, you don’t want to harvest. Harvesting an immature crop reduces the quality of the product and makes it harder to use the fiber for clothes, etc. Of course, once bolls begin popping open, there is no question! That cotton is ready to be harvested but farmers in the US will wait for most of the plant to be ready to harvest so cotton pickers can roll. In countries where people pick the crop, they sometimes pick as bolls open going through the field a few times. « How does a big rain impact a cotton farm early in the season? Are there cotton farms anywhere near St. Louis? I would love to go see what one is like. I haven’t really heard about farmers around here growing much besides corn and soybeans, or fruit and vegetables. Still, I would love to join you sometime on a farm tour. I have a feeling I would learn so much more with you by my side. The closest ones are down in the Missouri Bootheel. Maybe I need to get a group together and go down one Saturday! Janice, very interesting! I’ve always been interested in learning about the cotton industry as it’s one crop I’ve never had experience with. Living in North Dakota, cotton is not a crop you see! Learning about the ways in which cotton grows, and how one can check the maturity, makes me want to read into it more. The pictures especially helped me understand what you meant by ‘bolls’ as I was confused when I first read that word for sure. It entertains me how we all are a part of agriculture, but the language used can vary so much! I look forward to reading more posts in the future! Thanks Justin! Glad you found it of interest. I have to say, I have learned a lot about North Dakota thanks to social media in the past couple of years…. If you have ANY questions, please shout cause I love answering questions about cotton! tI live in Northeast Kansas (zone 6a or 6b)This year and last year I have grown some cotton in my yard for fun.Last year I had a bumper crop.This year I have gotten some cotton bolls which have popped open, but I still have a lot hard bolls (it might be the cotton didn’t develop as fast this year because we had a cooler than normal August and a lot of rain).We have had some temperatures below freezing (one reported about 20 degrees).I have covered the plants up when it gets below freezing and several bolls have opened.I am wondering since there will be increasing low temperatures whether I can pick the hard bolls (before they have opened) and put them under a sunlamp or heat lamp to force them to open up..I would also love to visit a cotton field sometime.I suppose the cotton fields in Missouri boot heel have been picked by now.Thank you.